A proficient solution to your clinical workflow in pressure monitoring. 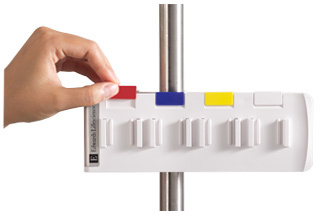 The next generation Edwards TruClip holder provides a streamlined and efficient sensor organization that can be used across the continuum of care – from OR into the ICU. 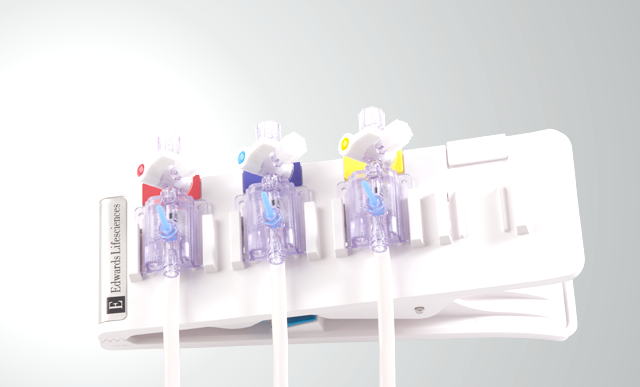 The TruClip holder quickly attaches to a wide variety of IV poles; holds up to seven Edwards pressure monitoring, arterial pressure cardiac output (APCO) and blood sampling devices. The TruClip holder’s design facilitates quick setup by replacing traditional C-clamp holders that require two hands to operate. A simple squeeze-and-release clamping action allows single-handed operation for efficient mounting and quick adjustments in time-sensitive situations. Four color-coded mounting spaces on the front help provide a clear, uncluttered environment. By optimizing time to allow quick and simple organization of bedside systems to help reduce equipment clutter, the TruClip holder may improve the efficiency of invasive monitoring in the OR, ICU, ED and Cardiac Catheter labs. TCLIP05 8" L x 2.75" W x 2.5" H 2.5 lbs 0.5" - 1.5"
The versatile design allows the TruClip holder to work with a variety of devices, including the Edwards TruWave disposable pressure transducers, VAMP Adult and VAMP Plus closed blood sampling systems, Z-site sampling ports, FloTrac sensors and VolumeView sensors.